After making some 2,000 photos during this Venice Carnevale, I have sorted through them to share with you. For me the costumes weren’t super exciting, though there were two I really liked. But there were the exquisitely beautiful costumes which can be rented from various shops in Venice. 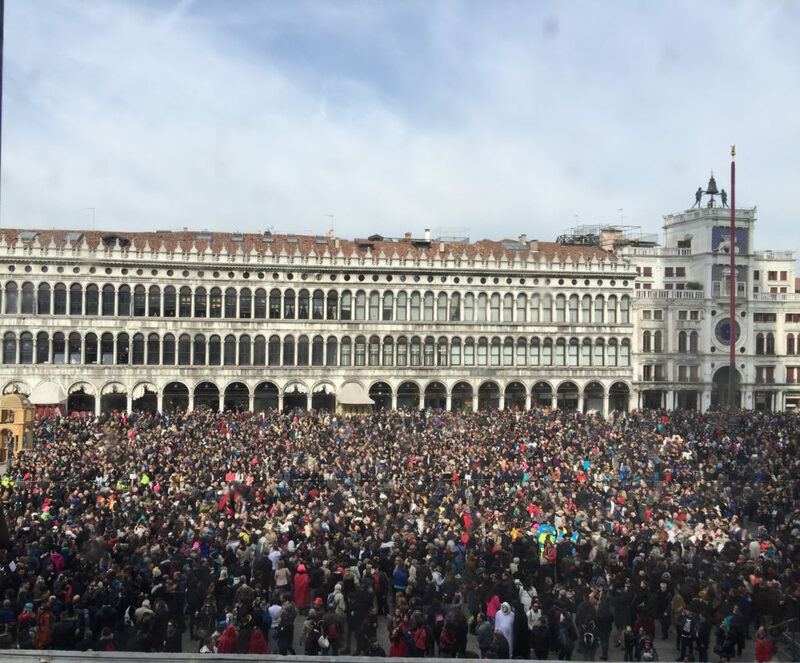 For my Venetian friends, they felt that it lacked the spirit of Venice, even though there were some 120,000 people in the piazza. Infact seldom was seen a Venetian unless they were working in the shops. The announcer (same as last year) seemed to be really working to make the appearance of fun. They said there was no Schei (money) in the city coffers. Yet I note that there were events, festivals in Mestre (the step-sister of a town on the mainland) noting that the current Mayor hails from this town. Here’s the scene in San Marco Sunday when the Eagle Flies. This crowd was estimated to be about 80,000. The prior Sunday when there was the Flight of the Angel the estimate was for 120,000 people. These people arrive in the morning on trains, buses, and tours. The car park at Piazzale Roma was closed by 10 a.m. Most people just come to see the costumes and after a couple hours go home. The police have learned and create a “one way” only route which gets these thousands of people from the station to San Marco and back again. Love this Costume, Completely from Cardboard! There were droves of visiting Costumed wearers in very expensive gowns. 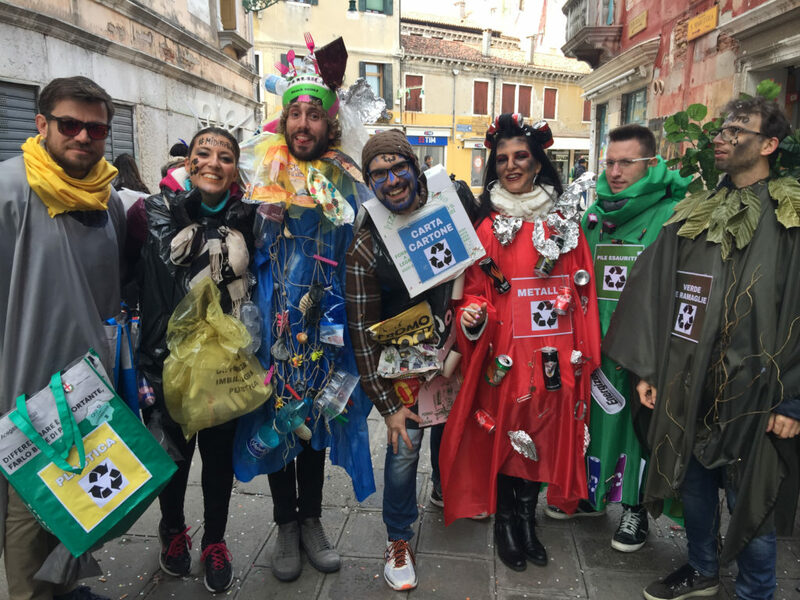 The rental fee per day can be up to 1,000 Euro and there are a few people who make their own costumes which takes months. Love the creative of this group of college students. 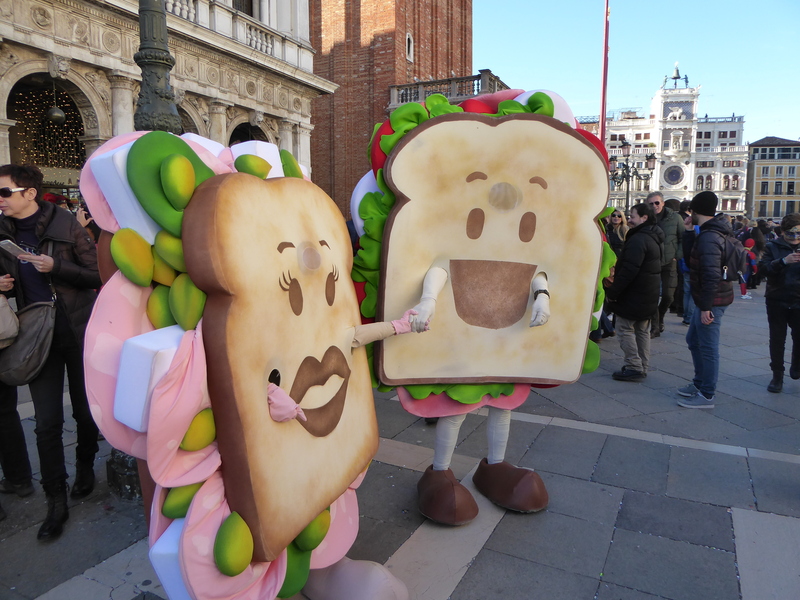 Here’s a few of those 2,000 photos I made, enjoy the sights of this grand party in Venice. Until Next Year…And if you’re thinking of going, its Jan 27,2018 through Feb 13, 2018. And for those costumes, try VenetoInside for a list of tours, where to rent costumes and parties. Thanks for the photos and insider information. Always interesting to learn from someone who knows the place. But how can they make no money out of such a hugely popular event, which is on every year? And why are the only Venetians those working in the shops? Such a sad position. Venice is so unique and beautiful, but it’s being lost, I fear. I’ve been there 8 times, so far. I adore making my own jewellery pieces to wear, and to sell, from the exquisite beads they make there. Thank you for bringing them to me. Thanks for your answers. I do understand how the locals would prefer to party con famiglia, away from the tourists. But hopefully, the locals do make some money out of costume hires, the balls and catering, etc. As always, I do enjoy reading about Venice from your perspective. your post. I am from NY only 30 min. from NYC, we love visiting to see the Rockefeller Tree..but also have learned to see it from our car…too many tourists..we don’t consider ourselves tourist …so we have our own house family party when the Tree is lit…. We went to Carnival this year and made our own costumes to wear. It was a real spectacle and we did attend a Ball and another event. We came to Venice a few days early and there was so much to explore and take in. 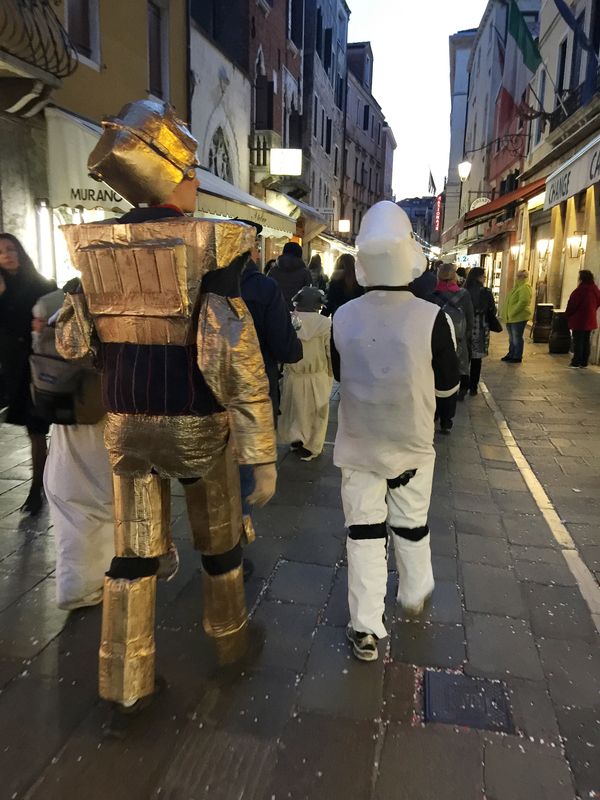 We had very different costumes fro the rented ones and the Venetians that befriended us loved them because we made them and they were different. I would love to go to Venice every year – it is a magical place. The costumes people make are the best. As I said, I am bit over the traditional ones which get rented each year. The other costumed people really do appreciate the creativity and know the time it takes. We have always made ours, many hours of needlework and preparation! Don’t you love how people in costumes stop patiently for pictures. So fun!